Jordan Hollett the other way. The Pats also acquired a second-round selection in the 2018 bantam draft and a fifth-rounder in 2019 in the deal. Bradley, 20, had 34 goals and 43 assists in 70 games with the Tigers this season. From Surrey, B.C., he was a fifth-round pick by the Montreal Canadiens in the 2015 NHL draft but has yet to sign a pro contract. In 209 career regular-season games, Bradley has 74 goals and 94 assists. No doubt the Pats will be looking for Bradley to replace some of the offence lost with the graduation of F Adam Brooks, the team captain who put up 250 points and won a scoring title over the past two seasons. The Pats now have six 20-year-olds on their roster, with the others being G Tyler Brown, D Connor Hobbs, D Sergey Zborovskiy, F Filip Ahl, F Austin Wagner and F Wyatt Sloboshan. It’s doubtful that Ahl, who is from Sweden, and Zborovskiy, a Russian, would be back as two-spotters, so that would narrow the field with each team allowed three 20s. Don't forget, too, that Hobbs has signed with the NHL's Washington Capitals, while Wagner has a deal with the Los Angeles Kings and Zborovskiy with the New York Rangers. Ahl's NHL rights belong to the Ottawa Senators. nephew to Regina general manager and head coach John Paddock. 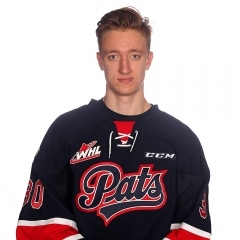 Hollett, from Langley, B.C., was selected by the Pats in the first round of the 2014 WHL bantam draft, the first time Regina had taken a goaltender in the opening round. He was 25-9-3, 3.30, .892 in 43 appearances with the Pats over three seasons. This season, he was 15-2-2, 2.83, .901. Hollett is eligible for next month’s NHL draft. The Tigers’ depth chart includes three other goaltenders, but two of them — Michael Bullion and Nick Schneider — are 20 years of age. Also there is Duncan McGovern, 17, who was a fifth-round pick in the 2015 bantam draft. 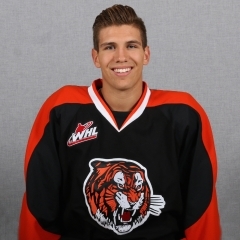 Other 20s on the Tigers’ roster are D Jordan Henderson, D Ty Schultz, Latvian D Kristians Rubins, D Brad Forrest, F Zach Fischer, F Mark Rassell and Swedish F John Dahlstrom. With that many 20s, albeit two of them would be two-spotters, we likely can look forward to another deal or two from the Tigers over the summer.